New York, NY, October 05, 2017 –(PR.com)– Power & Industry announces the availability of its new film, "In His Own Words," on Amazon. September 11th, 2001, a time in American history that devastated the country. First Responder and Army Combat Medic Garrett M. Goodwin was one of the many who tirelessly gave their time to assist in the rescue and recovery of thousands affected by the senseless attack on New York City. A calling Garrett eagerly volunteered for and unknowingly at the time, permanently changing the direction of his life, and inspiring the creation of The American Heroes Foundation, a non-profit organization that encompasses the brotherhood and compassion Garrett found while spending a life dedicated to helping others. The American Heroes Foundation, a 501c3, serves as a resource for Military/Veterans, First Responders, and their families who may be facing unforeseen circumstances, emotional adversity, or financial issues. “Helping our nations heroes do more than just survive, but to help them thrive,” Goodwin said. Under Garrett’s direction, AHF has quickly become an asset throughout the Military/First Responder community and recently announced plans for a full time outdoor recreational facility named “Camp Thrive,” 50 miles outside of Knoxville TN. 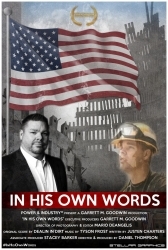 Garrett’s extraordinary circumstances during the events surrounding 9/11 have been documented in a new film titled “In His Own Words” now available for rental or download in cooperation with digital giant Amazon. “In His Own Words” features never seen footage of Ground Zero and the scale of destruction that cracked the stability of the nation. Garrett retraces his steps as he returns to Ground Zero for the first time 15 years after the brutal attack. The proceeds of the film will benefit The American Heroes Foundation and promote the initiative of “Camp Thrive.” And while Garrett battles the permanent effects of Chronic Obstructive Pulmonary Disease (COPD) and deteriorating health caused by toxic debris from Ground Zero, he presses on to share his account. In His Own Words. Donations to AHF or assistance requests can be made on their website theamericanheroesfoundation.org. Available now on Amazon: Click Here.